Adventure and volcano views await travelers in this modern mountain retreat with minimal site impact. 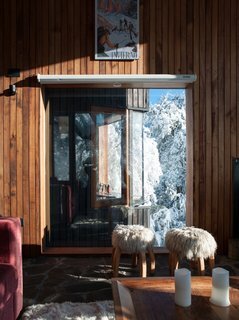 Nestled amidst remote forests in the Andes foothills, La Dacha is a retreat in every sense of the word. 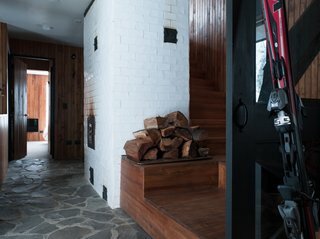 Here, guests are welcomed to a blissful immersion in nature as well as award-winning architecture, courtesy of Chilean architect and owner Nicolas Del Rio of DRAA, who fused Alpine and Andean influences into this modern take on a rural chalet. Backed up to the foothills of the Andes, La Dacha offers fantastic opportunities for hiking, mountain biking, as well as skiing in the winter. 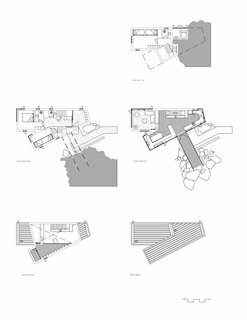 Most importantly, the site-specific cabin has been built with minimal disruption to its pristine environment. 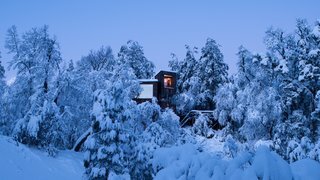 Slotted between ancient oaks and frost-bound lava rocks, La Dacha follows the natural topography as well as passive design principles. 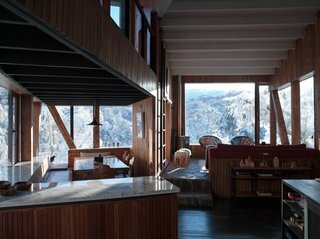 The timber-clad cabin is in the shape of a 'V' to optimize views of the Valle Las Trancas below. 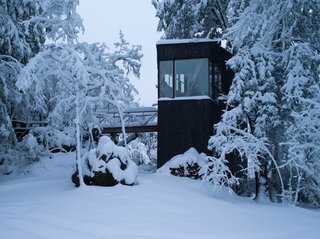 For ease of construction and high thermal efficiency, Nicolas constructed the roughly 1,500-square-foot cabin with SIPs—structural insulated panels—and blackened pine cladding, which was charred at the site using the Japanese technique of Shou Sugi Ban for natural protection against decay and rot. 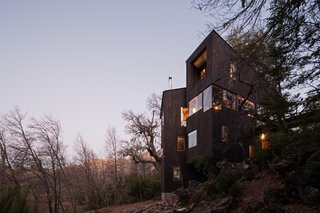 Set at an elevation of nearly 4,000 feet, La Dacha is lifted into an evergreen canopy. 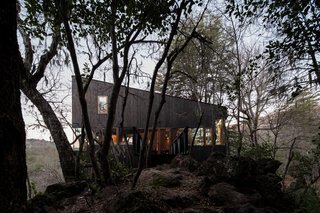 A timber-land bridge connects the cabin to a decked terrace. 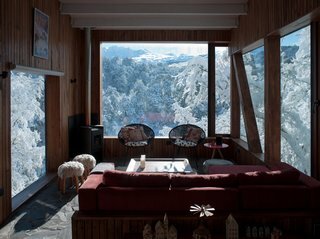 Natural timber also covers the interiors, which are lined in native Lingue wood and minimally dressed in an eclectic mix of modern and traditional furnishings selected by Nicolas and his wife during their travels. "My wife sourced pieces from nearly every corner of the world, from Canadian throws for the beds, to some Scandinavian details and Estonian cutlery," explains Nicolas. "We found Andean pieces such as stone mortars and human representations from the Mapuche culture." Here, a retro travel poster hangs above two fleece-covered milking stools. Primed for family getaways, La Dacha sleeps up to eight with three bedrooms and two baths across three floors. The open-plan living room, dining area, and kitchen are located on the second level. Large windows surround the home to frame spectacular views of the outdoors and also bathe the interiors with natural light. For the dining area, Nicolas restored century-old Tyrolean chairs that he found at a Santiago flea market. When asked about his favorite part of the retreat, Nicolas responds: "By far, I think it’s the surprise effect once you are in it. You don’t expect what you are going to see—something happens the minute you step in and look out at the volcanoes. It makes you want to stay and take it all in." 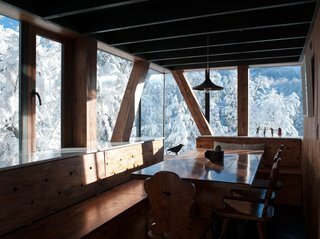 A small wood-burning stove anchors a corner of the living room that offers straight-on views of the snow-capped volcanoes. "It’s the way the views are framed, the dissipation of light and the fact that you are at the canopy level. You feel a calming sense of absolute solitude as you are surrounded by native woodland, mountains, snow, and volcanoes." 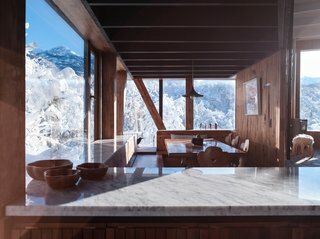 Clad in white tiles, the centrally placed Kachelofen, or masonry stove, keeps the cabin toasty with thermal mass radiation even after the fire's burned out. Water is sourced from local springs and waterfalls, and is then heated with a gas boiler. A night at La Dacha starts at $450 USD a night (including biweekly laundry and cleaning services) with a one-week minimum stay. Head to Off Grid Hideaways to book your stay.